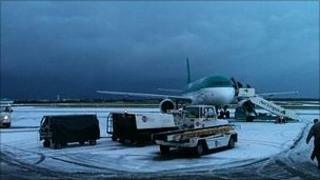 About 40,000 travellers have been stranded after Dublin airport closed because of heavy snow falls. About 270 flights have been cancelled. The airport will remain closed until 0500 GMT on Friday. Heavy snowfalls meant the runway had to be closed twice and cleared on Thursday. Meanwhile, in Belfast, police closed the middle Braniel Road because of treacherous driving conditions. Northern Ireland's airports have been operating although there are delays.